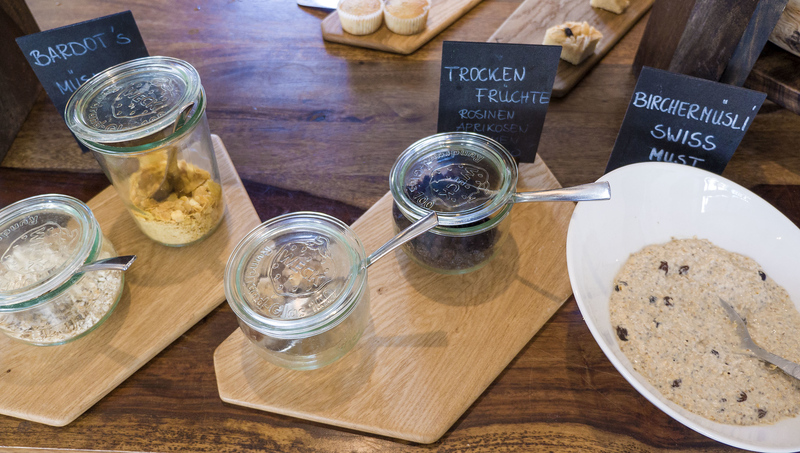 Did you know that Berlin has a fully vegetarian and vegan-friendly hotel? 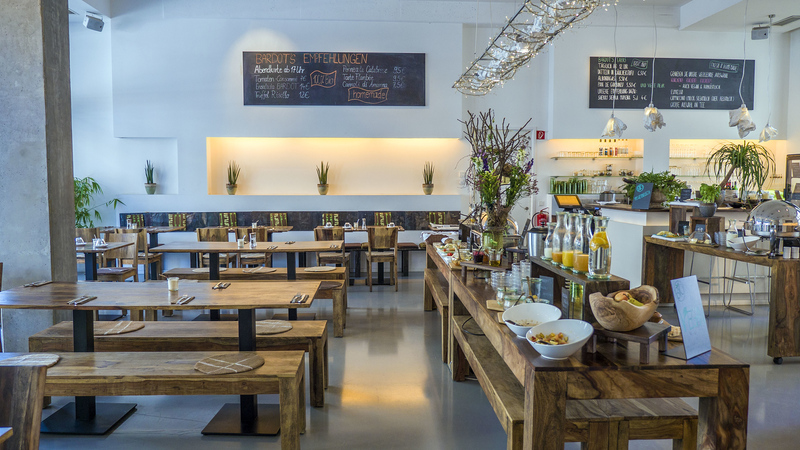 Berlin is an incredibly vegan-friendly city. In fact, Berlin is thought to be the vegan capital of Europe and perhaps even the vegan capital of the world. It makes sense that there are hotels that completely cater to a vegetarian and vegan lifestyle. 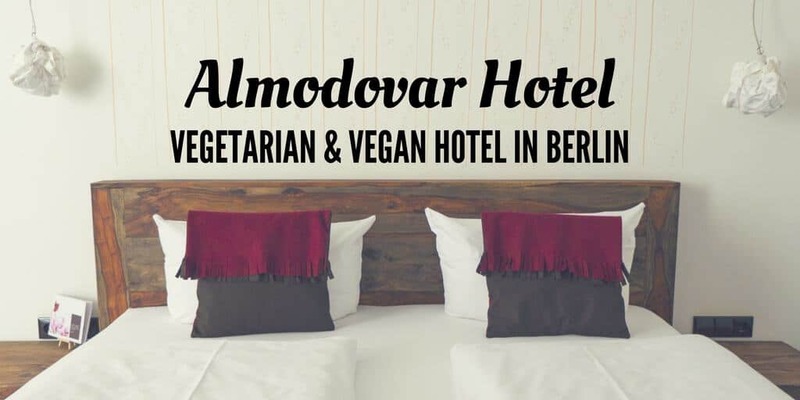 Almodovar Hotel is a vegetarian/vegan hotel in Berlin, and it’s the first of its kind in the city. Almodovar is an accommodation with a unique style and design. 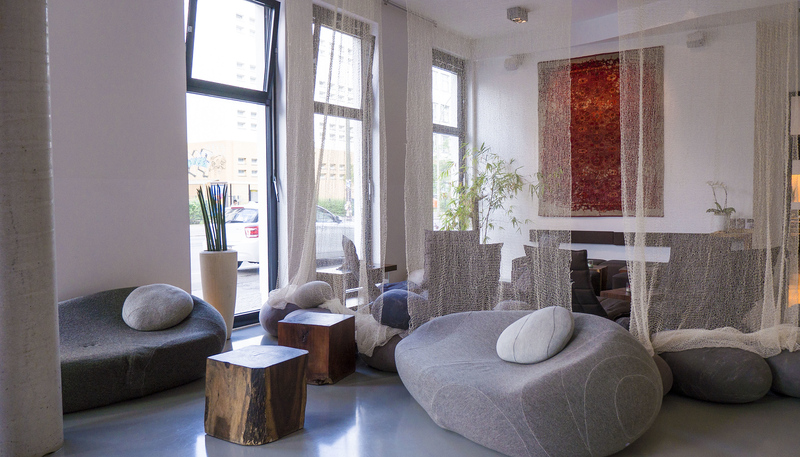 Furthermore, it’s not only a vegan hotel in Berlin, but completely organic with a focus on sustainability. 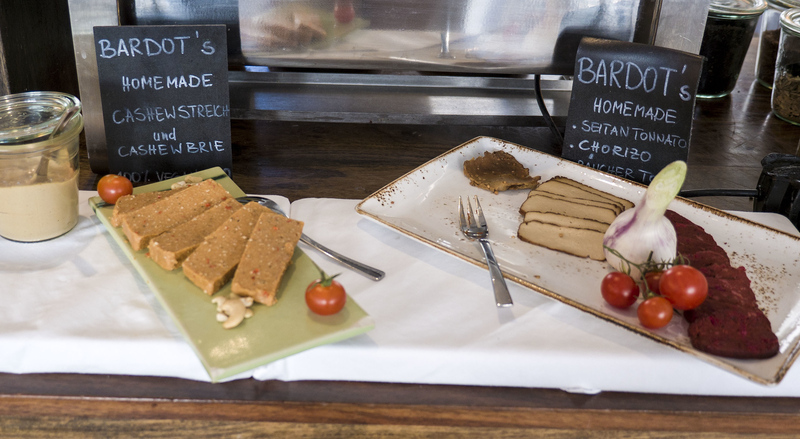 And of course, there are delicious vegan and vegetarian dishes served on site. Let me show you why Almodovar Hotel is a special place to stay, and why I would go back in a heartbeat. 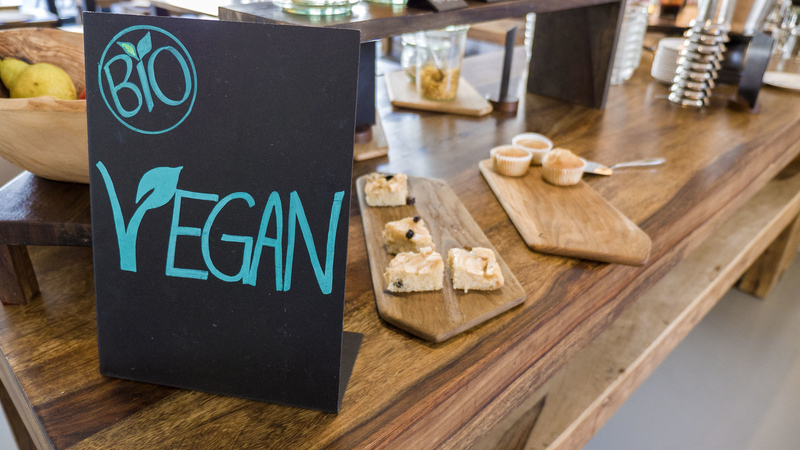 Have you ever stayed at a vegetarian or vegan hotel before? Ever had an epic breakfast at a hotel? 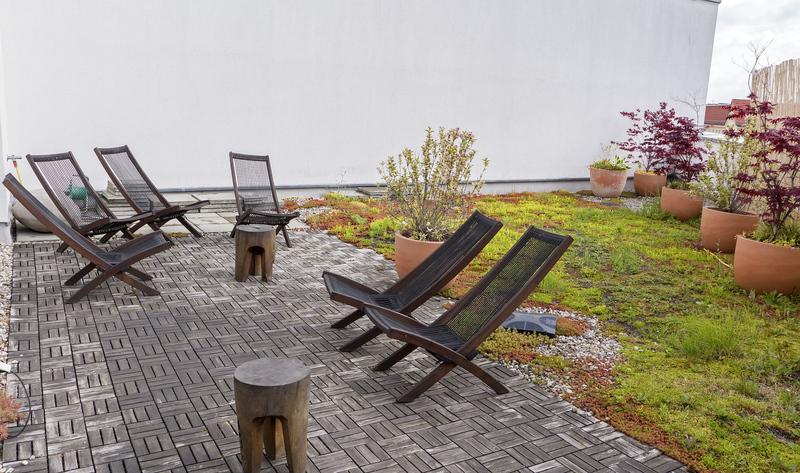 The folks at Almodovar realize that a hotel should be designed and operated as responsibly and ethically as possible. This means that the hotel and restaurant choose the most environmentally-friendly methods that are kind to people and the planet. For instance, the electricity in the building only comes from renewable energy sources. The furniture is made from wood that’s sourced from sustainable forests, and the bedding and textiles are made from organically-farmed materials. You won’t find energy-wasting refrigerators in any of the rooms. Even the cleaning products are natural and friendly to the environment. As for the food, you’ll only find vegetarian and vegan dishes which is better for our health and the planet. 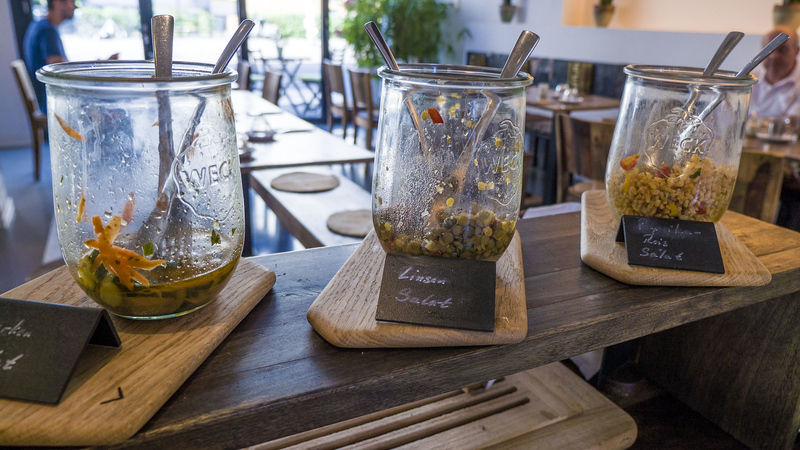 The meals use organic produce, the drinks are all organic, and local suppliers are favoured. The dishes use ingredients that are in season. In the design, we prefer to use organic shapes and materials. We have found treasures from all over the world. Benches made of a design-recycling project in Senegal harmonize with modern carpet design by Jan Kath, which in turn reinforces our fair-trade Asian carpets. The ultimate goal of the design is to make guests feel right at home, and Almodovar succeeds in this effort. From the moment you step into the hotel lobby, you feel relaxed and at ease. Our room was a calm retreat to return to every evening after a hectic day out and about. 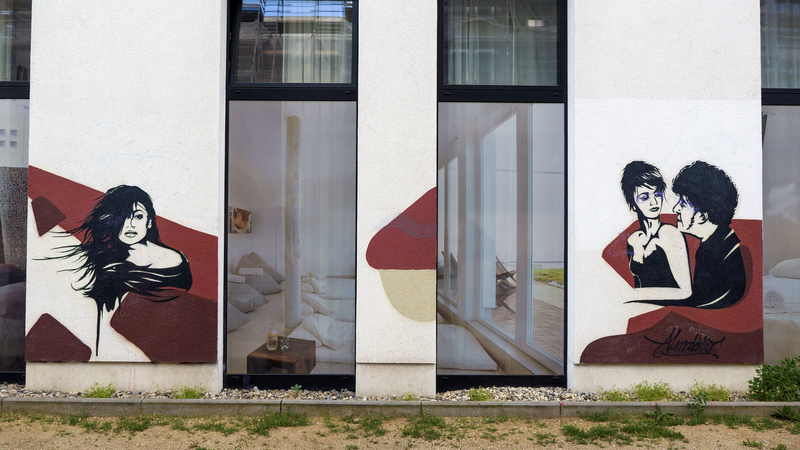 Even the outside of the building has tasteful art painted on the facade, keeping with the creative atmosphere of the Friedrichshain district. 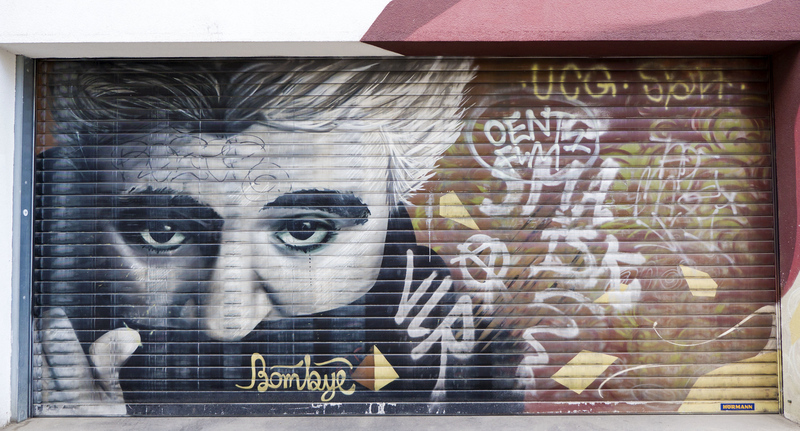 Street art found next door to Almodovar. 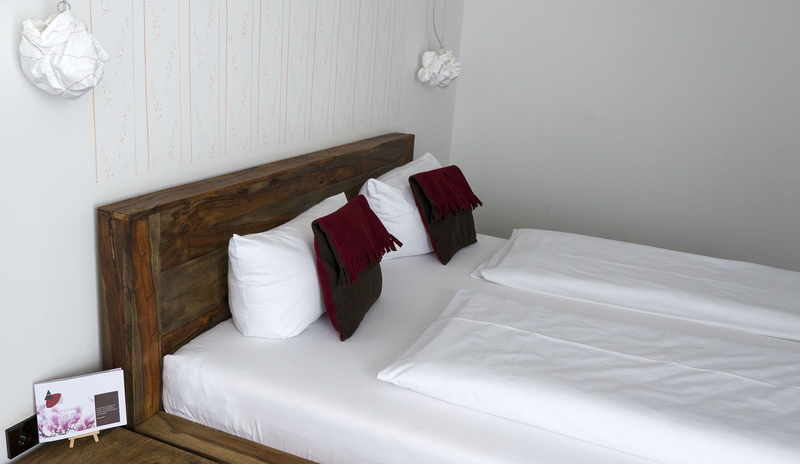 There are 60 guest rooms in this certified organic accommodation and vegan hotel in Berlin. 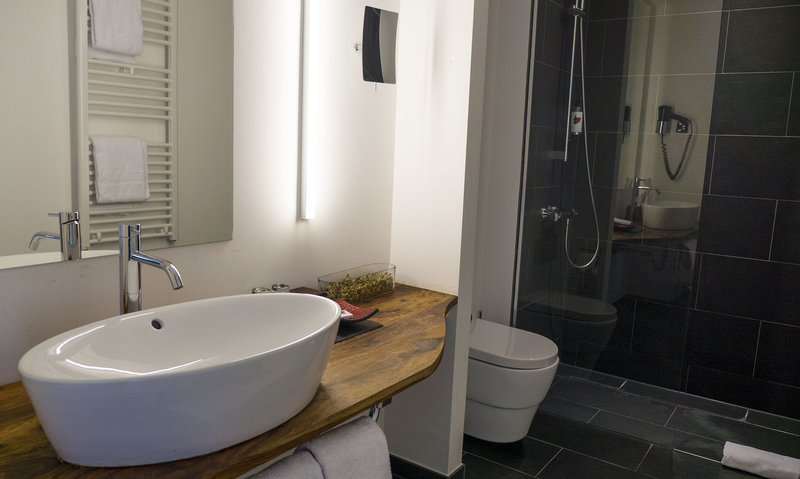 The style of the rooms reflects Berlin as a whole – modern, lively, and worldly. 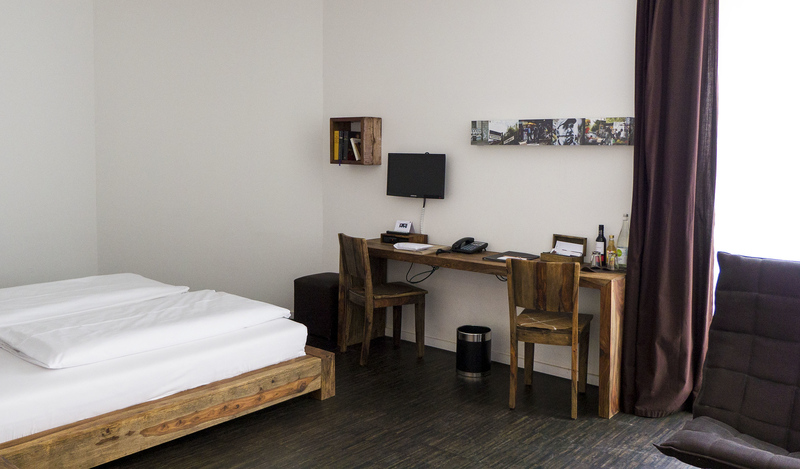 The bed frame, desk, and chairs are natural wood, while the flooring is made out of oiled wood from sustainable cultivation. 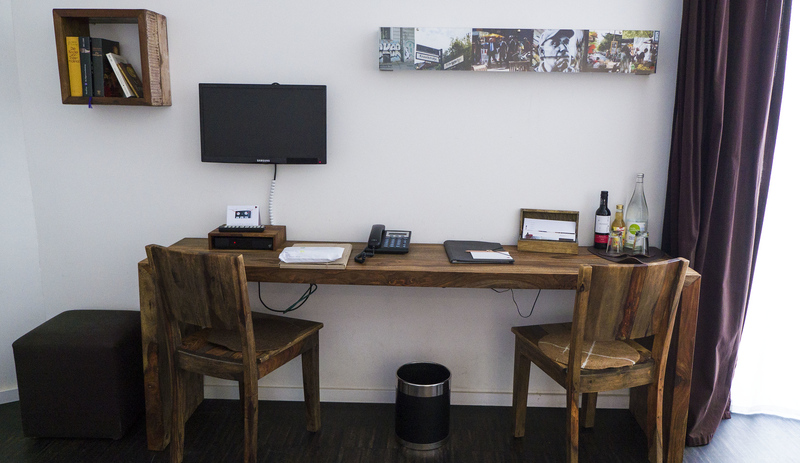 On the wall above the desk, there’s lighting showcasing images of this vibrant city. Overall, the vibe is minimalist, but cozy. 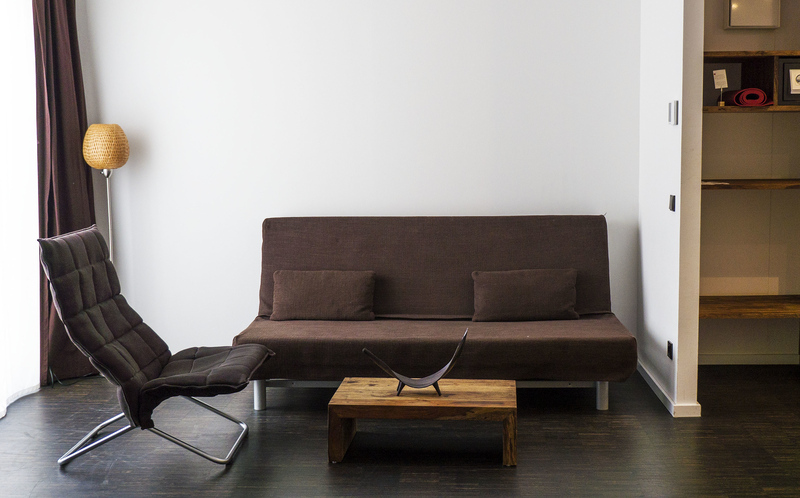 The space is quite roomy, even with additional furniture like a couch and a chair. 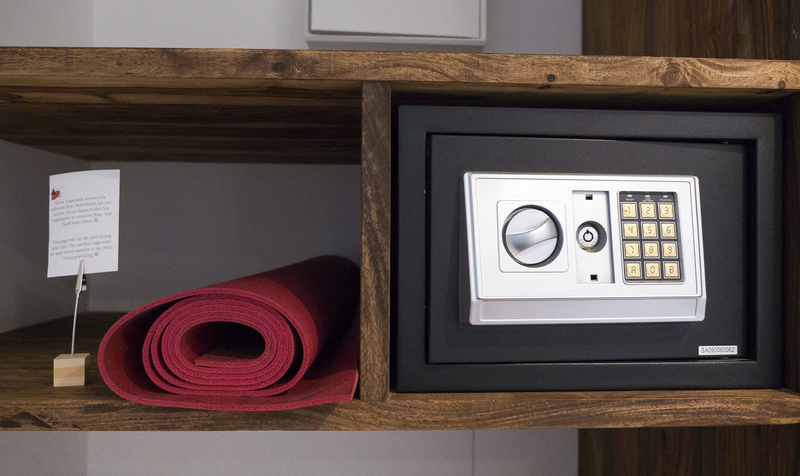 It’s so spacious that there’s even room to roll out your yoga mat. Did you forget your mat? Don’t worry, every room is equipped with one! In the bathroom, there’s a shower with organic toiletries. 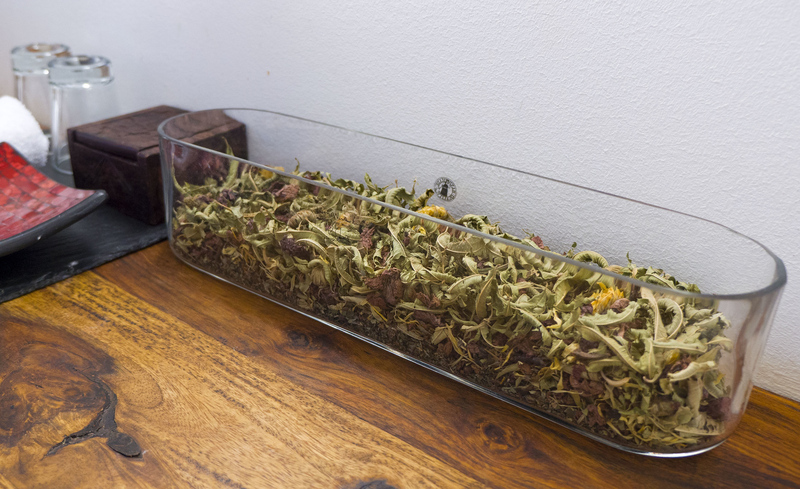 A dish with natural potpourri lends a mild, pleasant fragrance to the space. The view from our room overlooks a small courtyard with a restaurant patio down below. 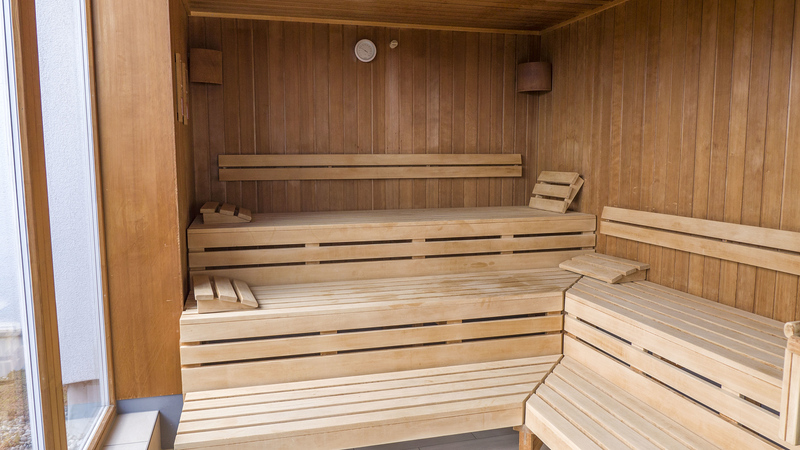 You’ll enjoy a dose of relaxation and wellness at the top of the building. 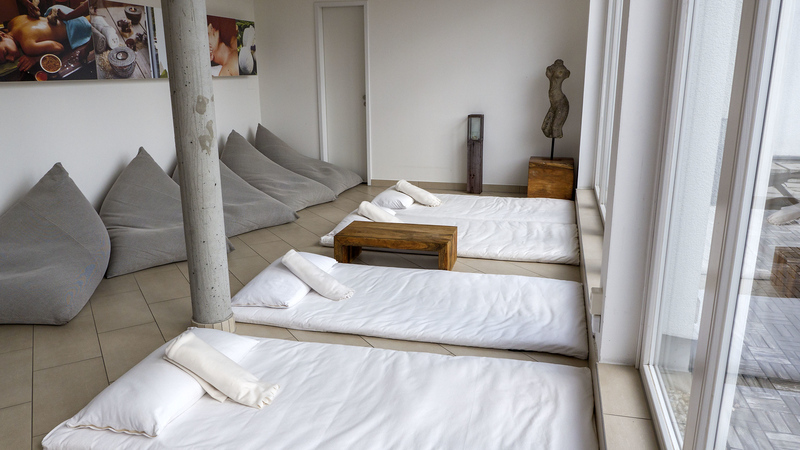 Almodovar’s rooftop spa offers tranquility in a peaceful environment. There’s a panoramic sauna and two sun terraces. Guests can choose between a variety of massages, spa treatments, yoga, and other mind-body interventions. Almodovar has an extensive health and wellness program that will rejuvenate your mind and body, even in a busy city setting. 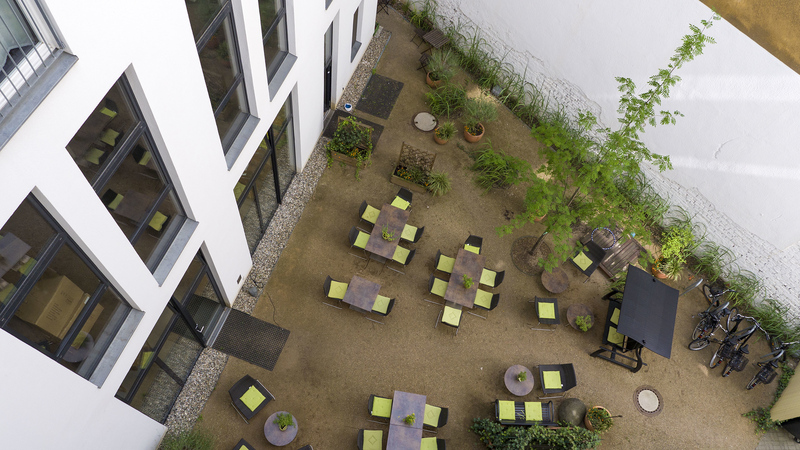 Looking for more photos of Almodovar Hotel and Berlin? Check out our entire Berlin travel photo album. I saved the best for last – the food! 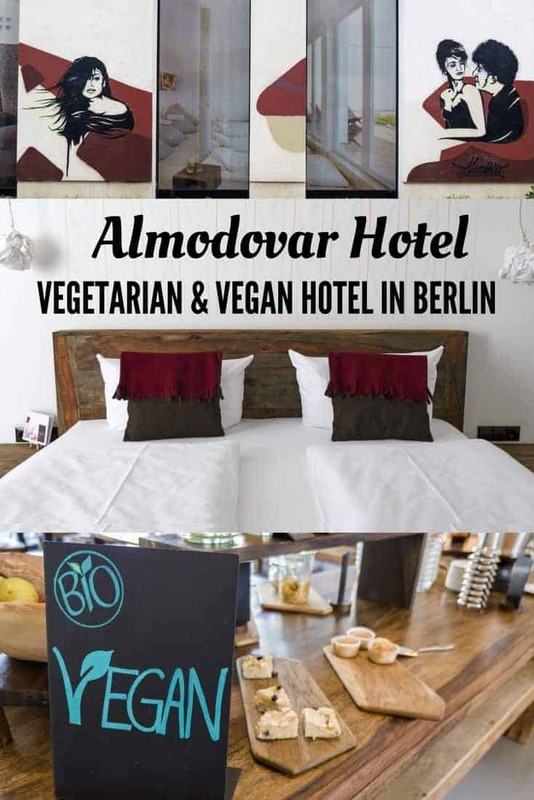 Almodovar Hotel certainly couldn’t call itself a vegetarian or vegan hotel in Berlin without serving up savoury veggie cuisine. BARDOT is the attached restaurant for guests of the hotel and members of the public. You’ll find that the menu has a Mediterranean flair. The food will please vegetarians, vegans, and even the meat-eaters in the crowd. We dined at BARDOT daily for breakfast. I was thrilled to see a massive vegan breakfast buffet. Typically at hotels, breakfast is where I won’t find a huge variety of vegan-friendly food. I’ll usually eat some fruit or a bagel with peanut butter if I’m lucky. 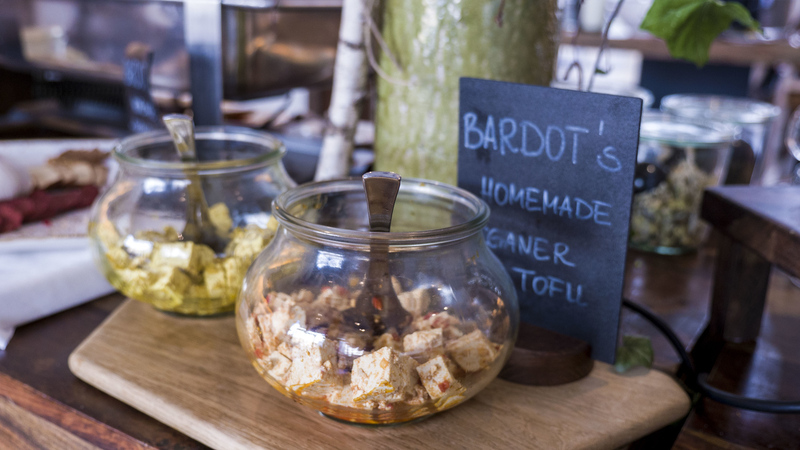 However, BARDOT has a huge spread of dishes and pastries that are all completely vegan. 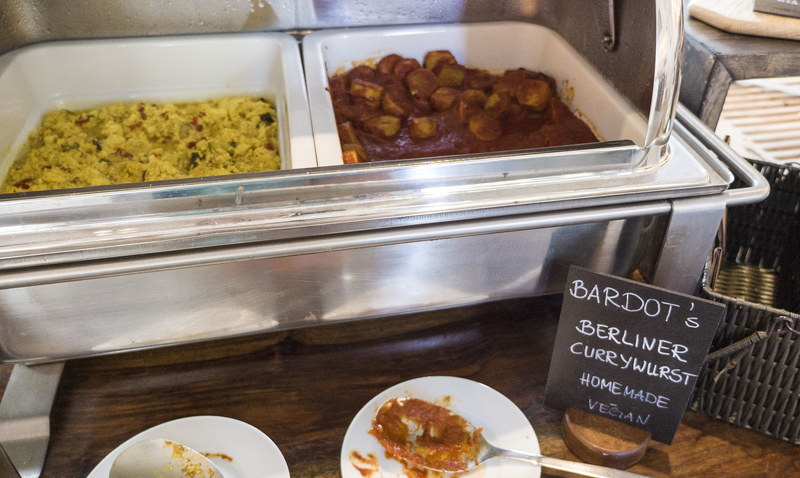 There is a small table with some vegetarian food, but the main buffet is 100% vegan. I was delighted with the variety of options at breakfast. I’m glad we spent three nights at the hotel, as there were too many choices to eat everything in one sitting (although I did try to fit a little bit of everything on my plate). 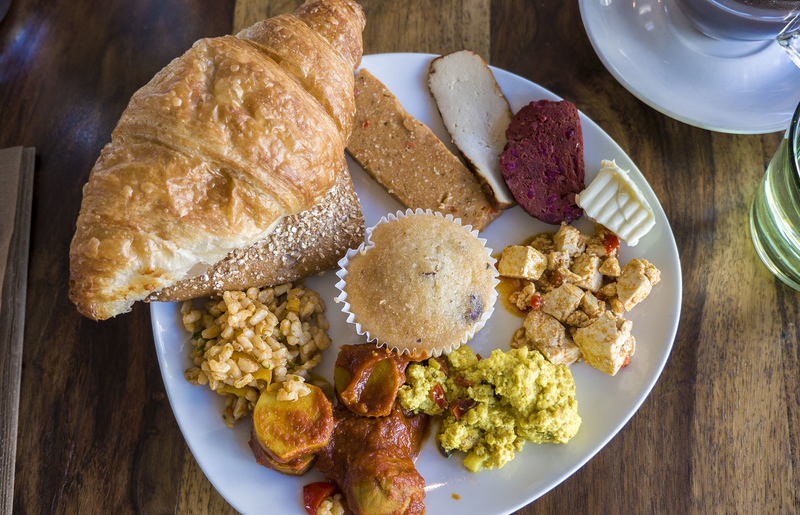 There’s two different kinds of tofu, a Muesli cereal, homemade cashew cheese, prepared faux meats like seitan and vegan chorizo, lentil salad, rice salad, homemade vegan currywurst, tofu scramble, bread, muffins, and croissants. Yes, vegan croissants. They are light, flaky, buttery, and delicious. 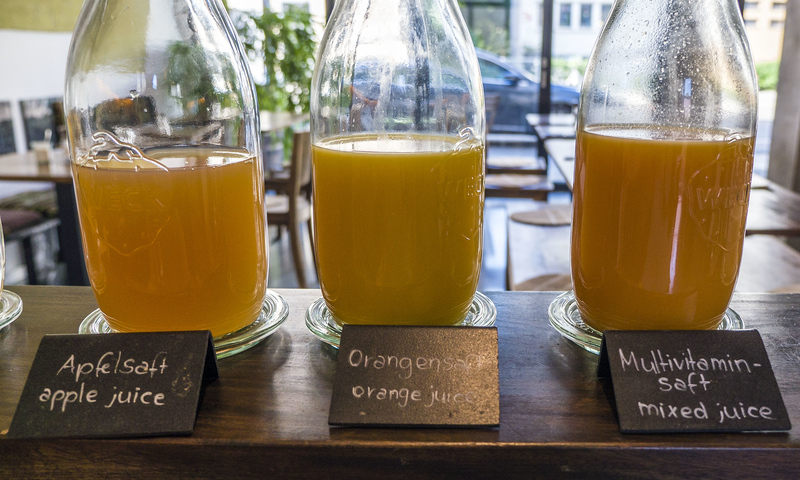 The coffee is robust and fair-trade, and there are also juices and teas. Staying at this hotel is worth it for the vegan breakfast buffet alone. We adored our stay at Almodovar Hotel and wouldn’t hesitate to return. 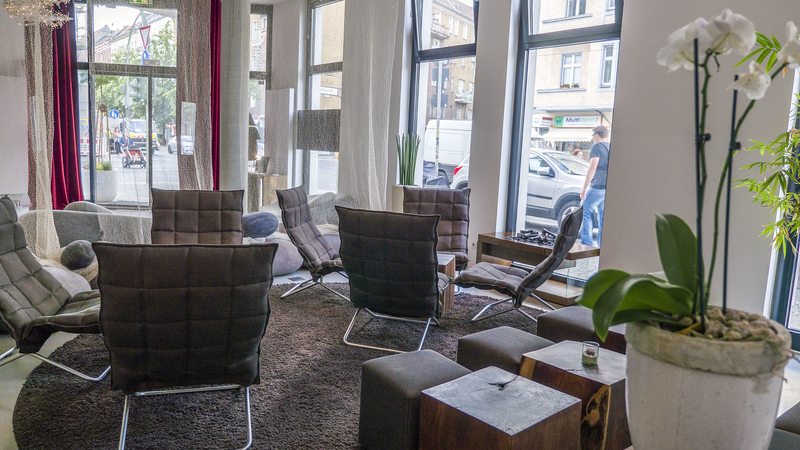 Located in the artistic Friedrichshain district, we enjoyed exploring this neighbourhood. When we felt like visiting other spots in Berlin, we hopped on public transit to easily get around town. The nearest train station is about a 10 minute walk from the hotel. The staff were friendly and hospitable from the moment we arrived. We felt very welcomed and we didn’t want to leave! I’m hoping that the trend of vegan hotels spreads around the world. Veganism and sustainability go hand in hand. 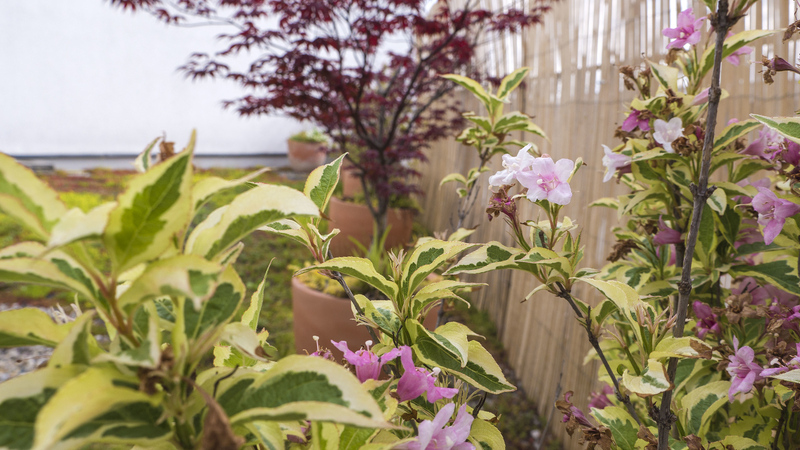 From design, purchasing, and everyday operations, Almodovar Hotel is thoroughly invested in eco-friendly practices. Being kind to the environment is very important, and I’m very grateful that this hotel makes careful decisions that are responsible and mindful. 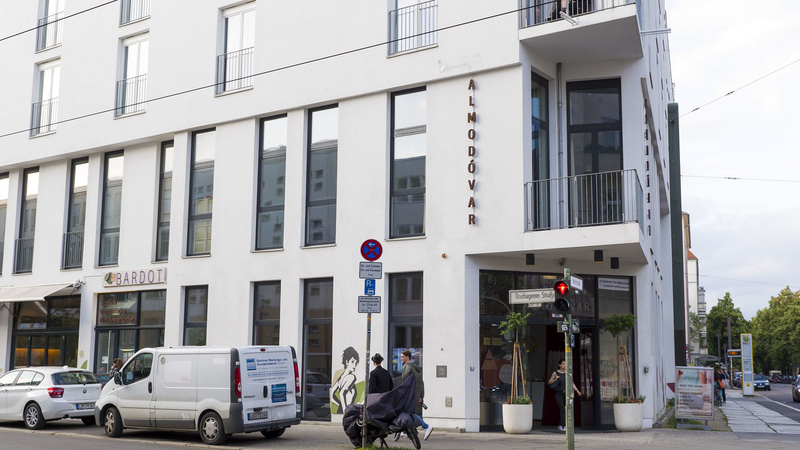 Book your stay at Almodovar Hotel when you travel to Berlin! Thank you so much to Visit Berlin and Germany Tourism for hosting our stay. I would actually go to Berlin just to stay in this hotel. Is that weird? I love the idea of knowing I could eat anything completely guilt-free! They should hire you to do their website!! I’m booked there next month but your report and photos are awesome. Couldn’t learn that much from their site. Thanks! Simply incredible. I did not imagine I had a hotel like this. Wow this is incredible! I must stay here next time I’m in Berlin, I try to eat as organic as possible and I am vegan as well. I couldn’t imagine a better hotel :P Thank you so much for sharing!